[DURHAM, NC] Ten member newspapers of the North Carolina Black Publishers Association, and NNPA Pres. Rev. Benjamin Chavis, have agreed to mount a statewide campaign to maximize the African-American vote for the 2018 midterm elections. And reaching eligible young people through an aggressive voter registration/issue education and mobilization effort is seen as key. North Carolina, Texas and Florida are considered to be important states that could change the makeup of Congress if the African-American vote flexes its muscle. The Black Press is considered essential in those states to mobilize that electoral strength. With billions, Rev. Chavis said, not millions, of dollars are going to be spent during this election, the Black Press in North Carolina and other states deserve their share. Unfortunately, both the Democratic and Republican parties have traditionally proven to be sorely lacking when it comes to supporting the Black Press when it comes to advertising. The Democrats, despite clear evidence that African-Americans are their most loyal voting base, have been accused of taking the black vote for granted. And Republicans have proven to ignore the African-American community entirely. NCBPA publishers agree that the political parties must be challenged immediately while advertising budget decisions are being made. NNPA Pres. Chavis, a North Carolina native, said that the get-out-the-vote (GOTV) strategy should be “data driven” for all of the state’s 100 counties. He noted that each of North Carolina’s African-American newspapers together cover the entire state, and once the pertinent voting data is obtained, a campaign should be developed around it, especially on social media and celebrity participation. Chavis said he’s seen figures from 2012 that the number of eligible, unregistered blacks in North Carolina was between 400,000 – 500,000. He said that figure is most likely higher now because of voter suppression, and the purging of state voter rolls. From now until September, Rev. Chavis added, voter registration must be emphasized. Then from September to Nov. 4th, GOTV must take center-stage. Part of the plan is to identify twenty North Carolina cities where the NNPA-CashWorks HD Productions 2014 award-winning film, “Pardons of Innocence: the Wilmington Ten,” can be screened in concert with a locally coordinated voter registration drive. NNPA Pres. Chavis, recognized as the leader of the Wilmington Ten – ten civil rights activists falsely convicted of arson, and imprisoned, in the 1971 destruction of a white-owned grocery store during the height of racial unrest – would accompany the film to speak with audiences about the importance of voting and citizenship. Ms. Thatch indicated that the film was successfully screened in Lumberton, NC in March to over 400 people from there and surrounding counties. Helping the community to understand that empowerment through voting is the key, Rev. Chavis said. Directing young people to register online via “Rock the Vote,” in part to eliminate the normal complications to voter registration, is also another strategy that should be implemented. Chavis also emphasized that NCBPA members should immediately seek to get available advertising dollars to publicize voter registration efforts. “We should make voter registration easy [for young people]. Not hard,” Chavis said. “And we’re going to have to develop an agenda to get young people to vote,” added NCBPA Pres. Mary Alice Thatch, focusing on issues like police brutality, poverty, the achievement gap, and better employment and small business opportunities. Additionally, economic development in the black community should also be emphasized as an important outgrowth of voting. In the meantime, the Black Press should begin now reporting about the value of the African-American vote in their papers. “We can’t expect other people to value us more than we do,” Rev. Chavis cautioned, adding that he was willing to come back to North Carolina to formulate the plan. The ten NCBPA member newspapers present were The Wilmington Journal; The Carolina Peacemaker; The Carolina Times; the Carolina Call; The Carolinian, Greater Diversity News; The Fayetteville Press; The County News; The Daily Drum; and TheUrban News. Four of the NCBPA newspapers – The Carolina Call,The Urban News, The Daily Drumand The Fayetteville Press - are applying for membership in the National Black Newspaper Association. With the May 8thprimaries commencing in three weeks, and early voting beginning April 19ththrough May 5th, veterans of the 60’s and 70’s civil rights movement came to North Carolina recently to encourage black voters to study the issues, register to vote, and cast their ballots in both the primaries and Nov. 6thmidterm elections. On Saturday, Congressman John Lewis of Georgia came to Knightdale to attend a private fundraiser for St. Augustine’s University, urging all to support HBCUs. But the veteran civil rights hero also made the case for turning out the black vote. Urging the predominately black audience to “Vote like never before,’ Congressman Lewis credited black female Democrats in Alabama and Virginia with helping to defeat Trump-backed Republicans in the last few statewide elections..
Cong. Lewis then recounted the legendary March, 1965 Selma to Montgomery March. Led by his friend and mentor, Dr. Martin Luther King, Jr., Lewis recalled how black people in Alabama did not have the right to even register to vote without unconstitutional poll taxes. Lewis talked about how the Alabama state troopers blocked the 600 marchers as they came over the Edmund Pettus Bridge, and began beating them mercilessly with night sticks and bullwhips, and firing tear gas. Lewis – who was 25-years-old at the time - was seriously struck on the head, causing a concussion. 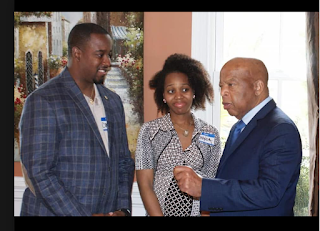 Lewis added that he was “so pleased” on the 50thanniversary of the Selma march to walk across the Pettus Bridge with the nation’s first African-American president, Barack Obama. Another veteran of the civil rights movement who came to North Carolina recently was Rev. Dr. Benjamin Chavis, a native of Oxford. Chavis, president/CEO of the National Newspaper Publishers Association, was in Durham April 6thto meet with black newspaper publishers statewide about strategizing to turn out North Carolina’s black vote for the midterms. North Carolina is considered to be a critical state in both the 2018 midterms, and the 2020 presidential elections. Dr. Chavis said figures he’s seen indicate that anywhere from 400,00mafde 0 to 500,000 eligible African-Americans across the state were not registered to vote in 2012. Every effort must be made to significantly shrink that number for the 2018 midterm elections. All efforts must also be made to register, and then mobilize eligible young people as well, by focusing on issues of most concern to them, like police brutality, and economic opportunity. Chavis also maintained that any get-out-to-vote strategy adopted by the state’s black press must be data-driven per all 100 counties. He urged black newspapers to begin reporting on the value of the black vote. “We can’t expect other people to value us more than we do,” Rev. Chavis cautioned. [RALEIGH] A conservative state lawmaker warned his colleagues Monday that if they don’t vote to arm teachers in North Carolina, the blood of murdered school children,”…will be on our hands.” Rep. Larry Pittman (R-Cabarrus), a strong proponent of gun rights, made the chilling prediction in an email sent Monday evening to fellow legislators. Pittman is a member of the state House Select Committee on School Safety. He called arming teachers and other school personnel “…The most practical, common sense, and constitutionally sound proposal of all.” Most teachers polled across the state oppose being armed in the classroom.